Here are some of my favorite apps, sun and moon information, space weather and more! Startails free software: www.startrails.de/html/software.html take a dark frame with the same exposure, put lens cap on the camera, and it can use that to reduce noise. Zerene Systems: Very precise with macro fine details. Photography Night Sky: A Field Guide for Shooting After Dark. I just finished up some book revisions for Photography Night Sky and want to share it with you. If you have a version prior to January 2014 you will have the first or second printing and here are the changes. It is now in the third printing in less than a year from being released! Check out #2 and #12 for flashlight recommendations. NEW: The smaller the f-stop number, the shallower the depth of field (the depth of sharpness), and the larger the f-stop number, the greater the depth of field. Tungsten lights are very warm toned, yellow in color, creating an appealing color when light painting. For a yellow, warm tone, look for Krypton, Xennon and Halogen light bulbs. Xennon and Halogen light bulbs are not as warm tone but still good. Led lights, such as headlamps and many flashlights, are very cool tone and blue in color. Some LED photographic lights (such as Lowel light panels), have dimmer switches to change the color temperature of the light from cool to warm. For example, in June, at 8 pm in Namibia in the Southern Hemisphere, the gaseous, denser part of the Milky Way is seen traveling from the southeast to the east when looking toward the horizon, moving overhead throughout the night. In June in California, at 11pm in the Northern Hemisphere, the dense part is seen traveling from the south to southwest when looking toward the horizon. Long Exposure Calculator Apps: there are a number of free apps, as well as others for a fee. NEW: Currently, DSLRs and a few rangefinders are the smallest cameras with the ability to capture excellent images of the stars, but the advent of the first full-frame sensor, some mirror-less cameras with fast lenses (delete suggests that they will soon join) have joined the DSLR cameras in the night photography game”. Medium format cameras with CMOS sensors produce acceptable quality with a f/2.8 lens. The older models with CCD sensors do not work well because they produced excessive noise at high ISOs or do not go to a high enough ISO. For rangefinders, the Leica 40 is good for stars. For mirror less, the Sony A7S and A7II are good too. NEW: The best months to see the bright center of the Milky Way are May, June, July, and August. NEW: Image Stabilization: This reduces the vibration of the lens or camera to get sharper images at slower shutter speeds when hand-holding the camera, especially used with long focal length lenses. It is also called Vibration Reduction (VR), Optical Image Stabilizer or Stabilization (OS or OIS) (Tamron), Optical SteadyShot, SR (Shake Reduction), SSS (Super Steady Shot) or VC (Vibration Compensation), Mega OIS. Image Stabilization is either lens based or camera based. Canon and most Nikon are lens based and Sony, Minolta, Pentax, Olympus and Nikon Zoom have camera based models. Most lenses or cameras do not do well with stabilization turned on when using a tripod or with long exposures (the exception being long lenses such as 500mm). Turn off for night photography. Some newer lenses claim it is ok to use it on a tripod as it detects it but I still don’t recommend it unless you test out your lens to find out if it causes any blurriness. This is because the lens/camera picks up on its own vibrations, causing more movement and a blurry image. I got a cheap off-brand tungsten flashlight when on the road. It died after the first use! Here are a few I now use but the options are endless. Warm toned Household Flashlight. My main flashlight for painting trees and rocks. Brinkmann Dual Rechargeable Halogen LED Spotlight (I have the previous model with Xennon light bulb but this one should work well. My second most used flashlight). Brinkmann Q-Beam Max Million III Spotlight- For buildings and mountains. Remove all filters: polarizer, solid and graduated neutral density and UV. Quick Tips To Photograph The Stars! First, use a wide-angle lens, such as 14-35mm actual focal length. This will allow for less movement of the stars and keep them more as points of light. The longer the focal length of the lens, the faster the shutter needs to be to stop the action and have the stars as points of light. Next, set the shutter speed around 15-30 seconds or less. I typically use 20 seconds with a 24mm lens on a full frame sensor. If you see movement in your images after reviewing them on the LCD screen on the back of the camera, then try using a faster shutter speed. This will vary depending on how much light is in the sky. For a dark night, try a wide-open aperture to get as much light into the camera as possible such as f/2.8 or f/1.4. If you have moonlight, then you can set your aperture to f/4 or higher. It is important to set the ISO high enough to get a good exposure because you don't want to have to lighten the images in post processing which will increase the digital noise. I put the camera in manual metering mode and set the exposure so that it is on the plus side by one or two stops. For a very dark night without the moon, try using an ISO of 3200 or 6400 to get you in the ballpark for the exposure. Be sure to focus on the stars. The easiest way is auto focus on a distant object during the day and tape the lens or focus on the moon at night. Be sure turn off the auto focus so it doesn’t change while your shooting. Using live view is another way. There is something very special about photographing at night with the beauty of the stars overhead. For me, it is both calming and peaceful. I hope by following my "quick tips to photograph the stars" you are able to take some amazing photographs. During the day I scouted for a location to return to at night. I was photographing with my friend Chris and when we returned at night, he no longer wanted to shoot! I walked out into the river to a rock bed to get a close foreground element of the moving water. Chris said to me, "if you fall in the river, be sure to hold up the camera and I will save it". I guess he has his priorities! I didn't include much of the sky because there was so much ambient light from the moon. Photographed at Zion National Park at f.2.8, 30 seconds, ISO 1600, 16-35mm II at 16mm, Canon 1Ds Mark III. Look for foreground elements such as rocks, mountain silhouettes or trees. The bristlecone pine tree is silhouetted against the stars with the Milky Way placed off center to balance the two elements in the scene. 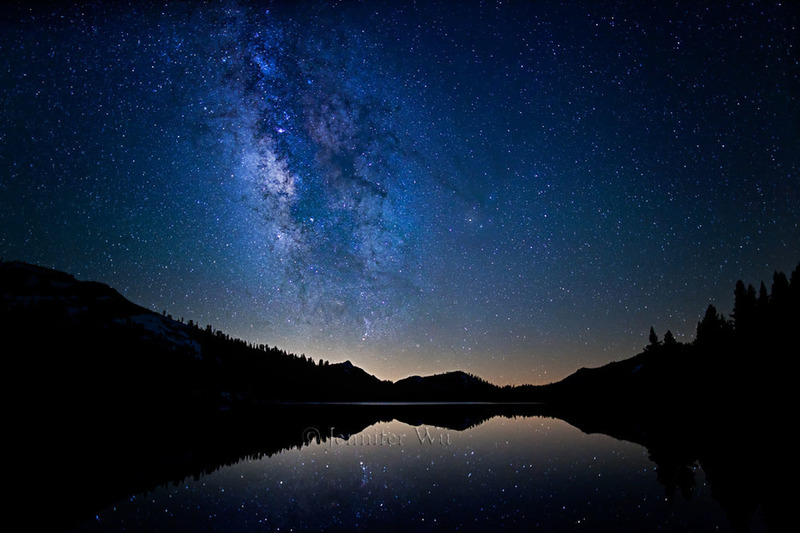 This image was photographed in the White Mountains, California at f/1.4, 20 seconds, ISO 2000, Canon 5D Mark II. 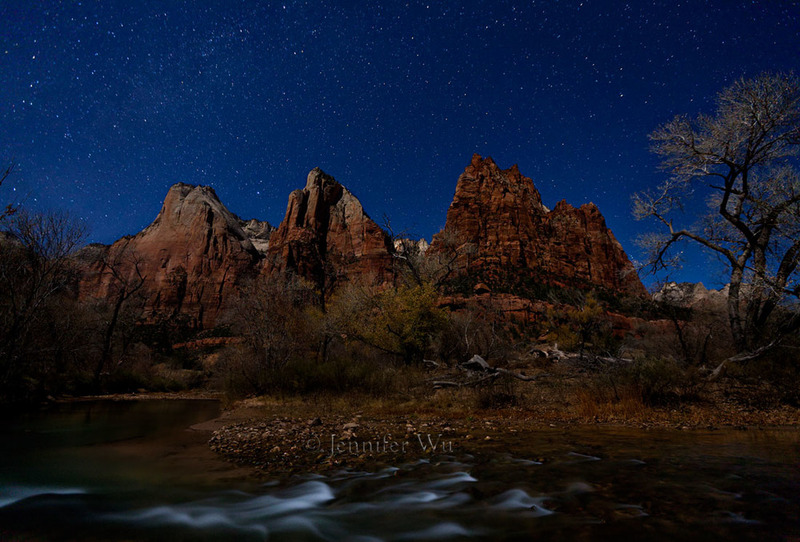 Jennifer Wu Photography Blog - Jennifer Wu, a professional photographer since 1992, is best known for her nature, landscape and night photography. Jennifer was named by Canon USA to the elite group of photographers, The Explorers of Light.